The central heating system is an integral part of your home. However, hidden away in lofts and behind walls, it is often easy to forget that there is a network of boilers, radiators, pipes, pumps, and tanks that make it possible to enjoy hot water and air in those dark, cold winter months. To ensure that your heating system is in tip top shape, it is important to have the proper type set up in your house. But looking for information can be daunting, as there are many variants to choose from. That is why we have compiled this page to give you an overview of the prices and types of central heating systems. The price you will pay for new central heating depends on the system and type you select. The price consists of the labour costs of installation and the cost of the actual components: boiler, radiators, piping, to name a few. Also, the cost will vary depending on what your goal is—replacing your old boiler for a new, more efficient model will be cheaper than switching from one type of central heating system to another, as this involves installing pipework and radiators. However, to give you a general idea of the costs associated with installing a central heating system, we have compiled a table of average prices. Purchasing a central heating system is not a light decision; you will have to fork over quite a bit of money if you are looking to install a full network of a boiler, radiators, and pipes. With such an investment, you need to carefully consider your options and take a look at as many providers as possible. With our quote request form, you’ll be able to quickly compare the services and prices of central heating system providers in your area. In just under 1 minute, you’ll have savings of up to 40% with our no-obligation quote request. You probably haven’t stopped to think about your central heating system. It’s easy to take it for granted and only when a problem arises, do you pay attention to your boiler and radiators. If there is an issue with your system or you are looking for an upgrade, it is very important to know the different types and their respective advantages and disadvantages. Which one is more efficient? Is one cheaper than the other? Does one type take up more space? This section explains the different types of central heating systems and their pros and cons. This is the most popular central heating system type in the UK and is commonly found in homes. You may be familiar with this type of heating system, with its boiler and radiators located around your home. Water is heated in the boiler, after which it is pumped to radiators to heat the air in your rooms. Another variant is under floor heating, where hot paper is pumped through pipes located underneath the floor, heating the room. There are different types of boilers and fuel that is used in wet central heating systems. This kind is usually found in commercial buildings, however can also be seen in some homes. Warm air systems were popular in the ‘60s and ‘70s and are not common today. Compared to wet central heating systems, these are less efficient, which explains their decline in popularity. In warm air systems, air is heated using a boiler and then pumped throughout the building via a network of vents. The boiler type and fuel can change similar to a wet central heating system, but a gas boiler is most common. 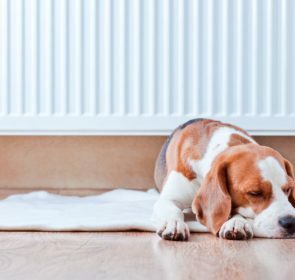 Storage heaters absorb and store heat during the night, during off peak hours, when it is cheaper, and then releases that heat throughout the day. Certain, more advanced models have settings that allow you to control the amount and timing of the heat release. The most common fuel types used are gas, oil, and electric. Go to each dedicated page to learn more details about each type of fuel. The main differences between these three boiler types are the required components, whether water is heated instantaneously or hot water is stored, and the mains pressure. To find out more about each type, visit our dedicated conventional, system, or combi boiler pages. Stay warm knowing you had the best deal! With so many different options for your central heating system, prices vary greatly. You are able to fully customise your heating system with specifications that best suit your home and your preferences. When contacting heating and plumbing engineers, make sure to state your specific needs so that the quoted price is tailored to you. Obtain these bespoke quotations quickly and easily by filling our form; with potential savings of up to 40% and a non-binding estimate, you will benefit immensely.